John Daly and his caddy Peter Van Derriet win the Buick San Diego golf tournament. Peter Van Derriet hails from South Africa. Peter played the European tour from 1986 thru 1992 and won three times on the South African tour. He came out to caddy three years ago on the PGA Tour after teaching golf at his brother’s golf school, to caddy for Deane Pappas. Then he worked for Deane's brother Brendan Pappas the next year. Peter knew John Daly for the last 20 years –having played tournament golf together in South Africa. CaddyBytes.com -How did it come about that you got to go to work for John Daly? Peter -"He’s one of my best friends -I've know him for 20 years we used to play golf together in S. Africa years ago. When Mick quit him last year I was the first one he called." 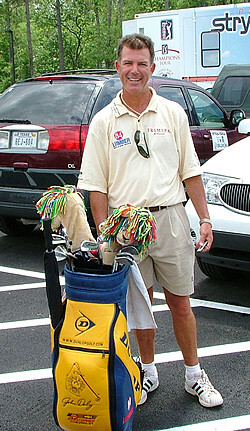 CaddyBytes.com -Give us a quick recount of the players you've caddied for in your career before caddying for John Daly? Peter -"I was teaching with my brother at a golf school when I came out to caddy three years ago for Dean Pappas. Then I was working for Brendan Pappas last year and then the job with John." CaddyBytes.com -Was that any kind of a transition for you going from a player to a caddy -was it an easy one? Peter -"No. I'd never caddied before. The hardest thing about it is getting in the way, learn to not do this -do that, where to stand, and so on. I pretty much knew the game and all that but the 'where to stand, what to do, how to rake a trap etc, -I had to learn, how to rake a trap, ‘I didn’t know what to do right off!" CaddyBytes.com -How about adjusting to John after working for the Pappas's, was that a difficult transition? How's he to work for? Peter -"He’s one of my best friends. He's easy to work for, does everything himself, I don’t have to do too much. (When you caddy for someone) -You’ve got to learn the guy, give him a goal. We have a lot of fun, I make him laugh all the time, if you give him little goals, if you tell him he can’t do something he’ll try to prove you wrong." CaddyBytes.com -I saw you caddying for John last year in Seoul Korea and you were on the bag there for the win which broke a long victory drought for John. How many tournaments was that you'd caddied for him before the win at the Korean Open? Peter -"That was my second week and he'd only played 27 holes in Canada before that my first week working for him." CaddyBytes.com -I've got to think that win in Seoul was a big stepping stone to the great victory at the 2004 Buick. (San Diego). At the Korean Open last fall they had the pins set up with many of the holes cut on side slopes and transition slopes to where the pins would ordinarily be placed. And it was a P.B. Dye golf course as well with a lot of slope in those greens as well making two putting almost impossible at times. I watched Justin Rose hit a four footer uphill and the ball horse shoed, stopped and then rolled backwards into the cup! Daly had the lead going into Sunday and he won the mental game with those greens by not complaining I believe. Do you think he doesn't get enough credit for having such a good mental game, a la two career majors and so on? Peter -"Definitely. As you know, you were there and saw what we had to do there. He played and putted well all week and was totally focused on winning the golf tournament." CaddyBytes.com -Having been a player and exposed to all the nuances of tournament golf how would you characterize John's style of play? Peter -"He’s a ‘Go-er’ whatever it is -that’s his style. When he gets in the situation you’ve got to let him go, You can’t say ‘It might be a 3 wood, don’t try to put any doubt in his head just let him have a go! Don’t try to talk him out of a shot. And he's well capable of pulling them off too!" CaddyBytes.com –Any examples of that from the great win at the Buick? Peter -"The first day at the Buick we were playing the (shorter and more scorable) North course, and with five holes left to play we were 1 over for the tournament. At that stage he wasn't real happy with that and I said to him, ‘Don’t tell me you can’t birdie four of the last five holes here!? Then he responded ‘What you mean!?' I said, 'You’ve won two majors and you can’t birdie four of the last five holes on this course!?' Then sure enough he did and we went on to shoot 3 under and that got us off on our way that week. That’s the moment I remember there that he got it going." CaddyBytes.com –Any other key shots or turning point. I mean that was one hell of an up and down on #18 in the playoff to beat those guys in the playoff on Sunday? Peter -"The bunker shot in the playoff was good but the two iron he hit into #18 in the second round was the most unbelievable shot I’ve ever seen. 260 yards out from a bare tight lie in the fairway to 18 feet and made it." CaddyBytes.com -No way! 260 from a bare lie over that pond in front of the green with a two iron!? How far did it carry in the air? Peter -"The ball carried about 248 (yards) in the air comfortably (over the lake in front of the green). He’s the kind of guy who can hit those type of shots -he'll just hit a big high long draw right into the center of the green. It was one of the most unbelievable golf shots I've ever seen in my life!" CaddyBytes.com -So you just basically give him the green light and don't tell him he can't get it done eh? Click Back to our Buick Invitational Tournament's page!